Thomas The Tank Engine Repair - The Model Train Repair Depot - We Can Fix It! 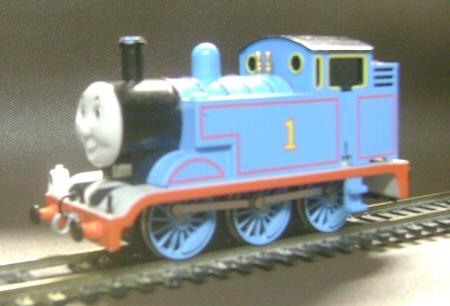 Bachmann Trains has a wonderful locomotive line of Thomas The Tank Engine and his friends. Unfortunately Lil Thomas is a tad bit underpowered. In approx. 4 years our train club has burned out three Thomas'. The kids love him but running him for 5 hour at a time during our setups takes a heavy toll on his motor. So I've taken the clubs burned out Thomas and I've rebuilt him. The original motor is a small motor more like what you'd see in a slot car. 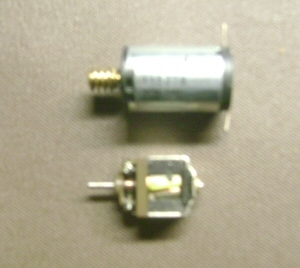 I'm replacing it with a bigger HIGH quality 12 volt motor made in Switzerland. These motors are expensive but the pay back will be well worth it. I will also fit this engine with a TSC DCC chip with anti-stall capability. Thomas' wheel base is so short that sometime he stalls out running through turnouts that have dead points or sometimes just dirty track can make Thomas not work properly. These new DCC chips with the anti-stall capability built into them is just what Thomas and his friends needs for smooth "JERK" free operation. The locomotive will benefit from this technology in either DC or DCC operation. Contact us through this form if you are interested in an estimate or to have your Thomas Tank Engine repaired. If you get an estimate from us and find it is too expensive and you don't want to get your engine repaired, please consider donating it to us. Every year we give Thomas trains that are donated to us away to underprivileged children. Please wrap the Locomotive and cars loosely in newspaper and drop it in the mail to the address below. Your locomotive will be repaired or parted out to repair another locomotive (depending on condition). Thank you in advance for taking the time to read this page and for considering donation.